Star brite Ultimate Aluminum Cleaner and restorer is engineered to bring back unpainted aluminum surfaces that have become dull or stained. Unlike other all surface cleaners, this product is formulated specifically for use on aluminum and strips away grime, stains and oxidation without harming the metal. 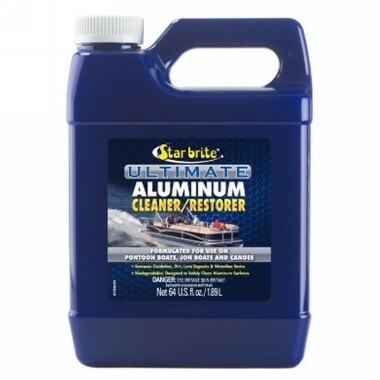 Ultimate Aluminum Cleaner and Restorer is the best choice for quickly cleaning and improving the appearance of all aluminum pontoon boats, john boats, canoes and other unpainted aluminum surfaces that have lost their original luster. DO NOT USE PRODUCTS CONTAINING HYDROFLUORIC OR OTHER DANGEROUS ACIDS! No aluminum is worth losing your skin or eyesight!